When they define a perfect setting to a football game, exhibit number one from here on out will be Sept. 28, 2013 in Athens, Ga. Athens as a football destination is second to none. For myself it is my own miniature version of heaven. Between the beautiful city, vibrant downtown scene, and on-campus stadium Athens presents itself as a football fan’s dream. Combined with the ideal fall weather the setting for yesterday’s game was nothing short of ideal. 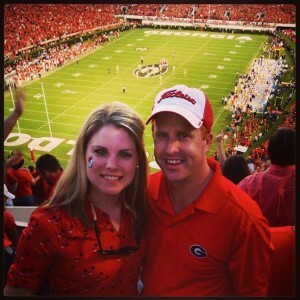 With my bride-to-be at my side, we made the short pilgrimage to Athens from Atlanta on Friday to see our first live game of the season: UGA vs. LSU. From the very beginning anyone could tell this weekend was going to be special regardless of rooting interest. LSU fans travel as well as any team, and it goes without question the fanaticism they have for all things purple and gold is unmatched. LSU’s fan base is perfectly represented by their coach, Les Miles. Immensely misunderstood, extremely passionate, and maybe not quite all there mentally are just a few ways of describing both coach and fans. LSU is one of the true blue bloods of the SEC. With their winning pedigree, they are a team that is always talked about as championship contenders. We’d need to help from everywhere in order for my beloved Red and Black to win. 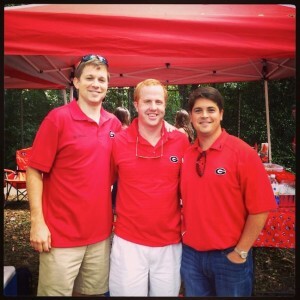 Georgia boys pregaming at tailgate. 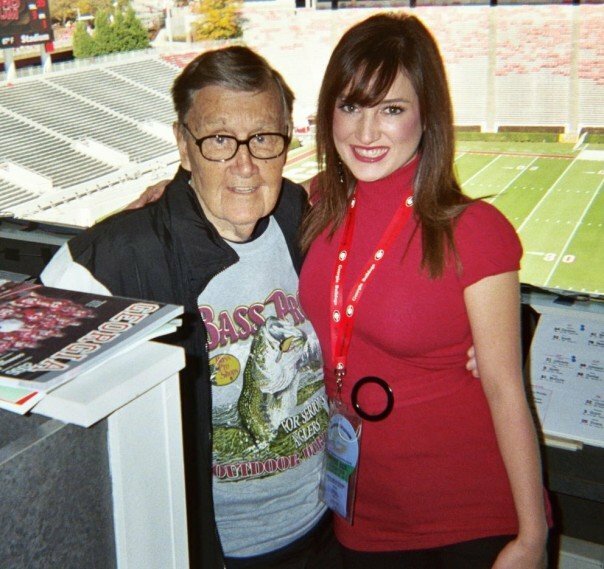 Let this be said about UGA fans, most do not see this team through rose colored glasses. If it can go wrong, we expect it to happen. We are led by two men who receive more criticism than is probably warranted. Our head coach, Mark Richt, is often criticized for his strong and unwavering faith. Yes, in the South a man is criticized for his faith because many feel it gets in the way of what ‘truly’ matters in most families, football. With him is the starting QB for the Dawgs, Aaron Murray. Murray will likely break every performance record in the SEC this year yet his backup (he of no starts and very limited playing time) in the eyes of many fans, should be playing instead of Murray. The game itself was full of implications. For UGA to remain in the National Championship conversation they must win out, plain and simple. LSU is trying to show they too should not be counted out just because they share a division with Alabama and TAMU. But the story goes so much deeper than that. As you’re probably well aware (I think CBS’s famed duo of Verne Lundquist and Gary Danielson maybe have mentioned it a time or two) LSU’s starting QB was a former Dawg himself. Having grown up in the Athens area and with his mom working for Athletic Department, Zach Mettenberger always saw himself throwing touchdowns in Sanford Stadium. He just didn’t realize it’d be for a visiting team. As with most SEC games (and seemingly every UGA game this season) this one was full of up and downs. At no time was either team up by more than one possession and that feeling of doubt was starting to creep into my mind. 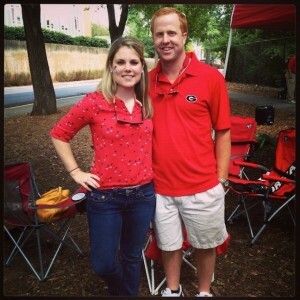 You see, I’ve been here before, along with thousands of other UGA fans. We’re always the bridesmaid and never the bride. So close, but not quite there. It is games like these that we’ve fell short on in the past. It is those games that have given rise to the issues I spoke about above. At some point in the last few years my mind, as some sort of a cruel defensive mechanism against getting too hopeful, I’ve started doubting everything that occurs on the football field. Sanford Stadium after the lights went on at sunset. Last year it was a tipped pass that left us just short of a National Championship birth. Earlier this year it was a dropped snapped for a game tying field goal. In this game it was Todd Gurley (the best player on the field no matter who UGA is playing) not returning to the game after an injury in the first half. 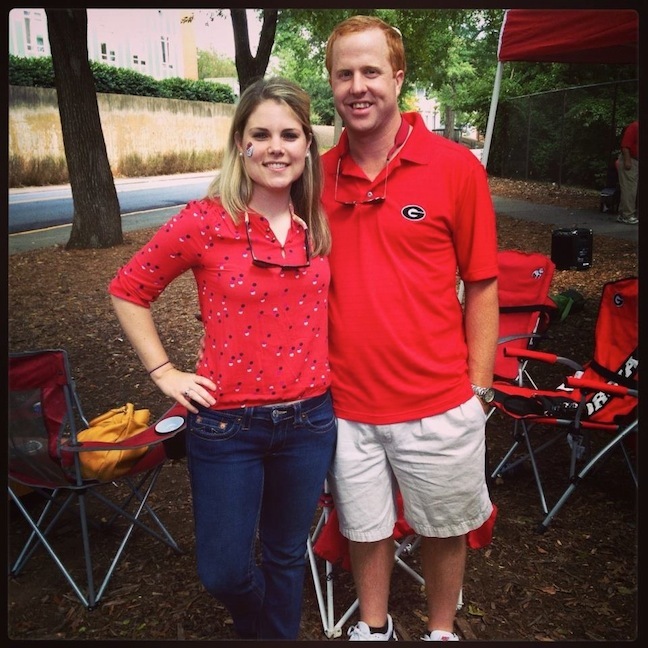 These are but a few of many examples that UGA fans have had to suffer through over the years. While I certainly wasn’t alone in my thinking I, along with the rest of the crowd, tried our mightiest to impact this game, doubt be damned. The ability of a crowd to effect a game may not exist in the NFL (minus Seattle and New Orleans occasionally) but it certainly does at the college levels. The passion and constant noise from the Sanford Stadium crowd was as great as I’ve ever personally experienced. Given that I was in the student section for the UGA vs. Auburn game in 2007 (the famous Blackout Game, just search YouTube for reference) those were words I’d never expected to write. Such was the constant noise that our own defense was negatively affected by it. So the game is winding down, a game that is proving to be a microcosm of my UGA fandom, and nothing is settled. UGA has just scored; the crowd is in a frenzy. LSU does nothing but go backwards on 1st and 2nd down leaving them with a 3rd down and 22 yards — a distance that is generally insurmountable. UGA needs one more stop and the game is effectively over. Of course that didn’t happen, and the doubt creeps back in. LSU capitalizes and scores, because nothing is ever as easy as you’d like it. In comes Aaron Murray and even with the previously mentioned accolades many had to be doubting he had the ability to lead the team to the win. And then the fun began. Murray and UGA (I’m remiss to have taken this long to mention just how awesome the rest of the offense has been all game) continue what they’ve been doing all game long, carving up the LSU defense en route to what would be the game winning touchdown, but still that doubt. Until the clock hit 0:00 (and there were still fireworks to be had) the doubt remained. A minute later it’s 4th and 10 and an incompletion by LSU seals it. Oh if Larry Munson were to describe the scene (something I won’t even attempt to do). I personally hugged no less than a dozen grown men (much to the chagrin of my fiancée) and am pretty sure saw a few others crying. This wasn’t a game that guaranteed anything. It’s only September after all and there are still many more months of football to be played, yet the relief was evident in so many, fans and players. Fans weren’t running to the exits; instead, many were staying to continue the celebration with the team. Sure the game was won by the team, but they’d be the first to say the fans carried them as well. As the fans finally started to dissipate the band kept playing, not wanting to lose the feeling. I don’t blame them. While this was just one game, and football is just a sport, it is truly a religion to many of the 92,000 who made their way inside Sanford Stadium that night. If security would have allowed, I might never have left. Fans would celebrate all over Athens until the sun came up (quite literally in some cases). The famous chapel bell would ring all night. As for myself, I was content to just sit, relax, and smile. My fiancée, while local to Atlanta has never taken to football the way many have. She often questions my ‘fall religion’ but even she in that moment had to understand my emotions. The season is young but UGA has made it through the early gauntlet and remains in control of their own destiny. I can’t ask for much else. See you next time between the hedges. Jarred Bussert graduated from the University of Georgia in 2007 with his Bachelor’s in Real Estate from the Terry College of Business. You can find him in a red polo most Saturdays in the fall.